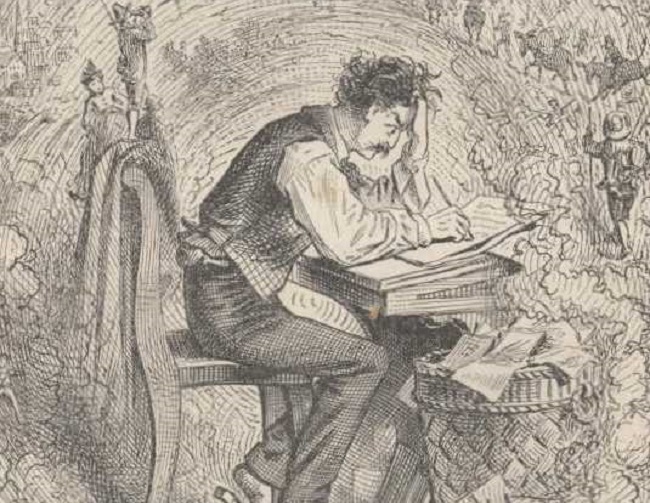 Detail from “The Author’s Memories,” drawing by American illustrator True Williams (1839–1897) for the first edition of Mark Twain’s A Tramp Abroad (1880). Click on image to see the full drawing. By the early 1890s the publisher Charles L. Webster and Company, founded in 1884 by Samuel Clemens (a.k.a. Mark Twain), was deeply in debt. The outfit had not been able to repeat the extraordinary success of its first two bestsellers, Adventures of Huckleberry Finn and the Personal Memoirs of Ulysses S. Grant. The firm’s bookkeeper embezzled tens of thousands of dollars. Charles Webster, the director of the press, died in April 1891. In addition, Clemens’s numerous investments in patents and machines worsened his financial situation. He sunk approximately $300,000 in a failed invention called the Paige Compositor, a typesetting machine its inventor hoped would help automate the publishing industry. He also lost $50,000 on the Kaolatype, a new (and equally unsuccessful) method for printing illustrations. For her health’s sake, Mrs. Clemens must try some baths somewhere, & this it is that has determined us to go to Europe. The water required seems to be provided at a little obscure & little-visited nook up in the hills back of the Rhine somewhere & you get to it by Rhine traffic-boat & country stage-coach. Come, get “sick or sorry enough” & join us. The Clemens family shuttered the house and found new positions for all the servants. In a letter to another correspondent, Clemens indicated that he had originally “voted” to travel in Europe for only thirty days, while his wife thought six months would be ideal—but the family remained for four years, staying at the spa resorts in Aix-les-Bains and Marienbad along the way. 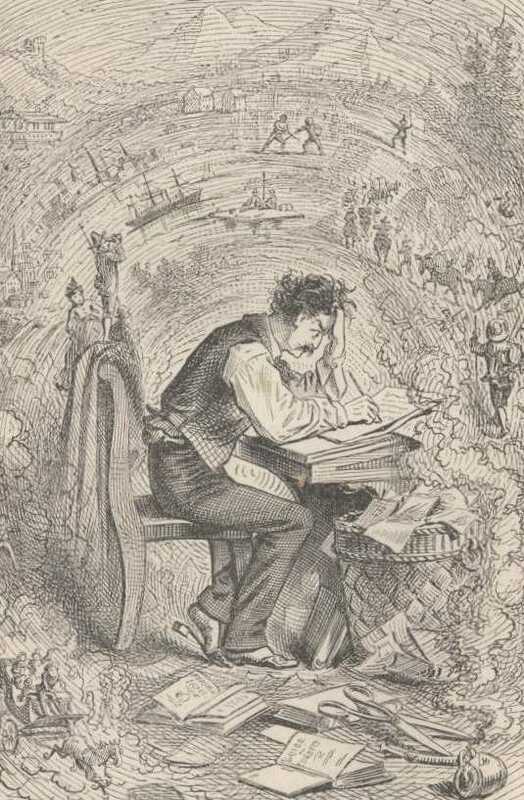 The European trip seemed to provide Clemens with the motivation and material he needed, and he was able to finish five books: a collection, The £1,000,000 Bank Note and Other New Stories, followed by the novels Pudd’nhead Wilson, Tom Sawyer Abroad, Personal Recollections of Joan of Arc, and Tom Sawyer, Detective. He was also commissioned by the New York Sun to write a series of articles for $1,000 each. All but one of the pieces are (mostly) factual travel accounts. The exception, the short story “Playing Courier,” shows Twain at his zaniest. Webster & Co. shut down in 1894, and Clemens was forced to declare bankruptcy. (A far more devastating event befell the family in August 1896, when the eldest daughter, Susy, died of spinal meningitis at the age of twenty-four.) Even though he was not legally required to do so, by 1898 Clemens paid off all the debts incurred by his insolvency, using the proceeds from a worldwide speaking tour and from the success of his final travel book, Following the Equator. A time would come when we must go from Aix-les-Bains to Geneva, and from thence, by a series of day-long and tangled journeys, to Bayreuth in Bavaria. I should have to have a courier, of course, to take care of so considerable a party as mine. . . . If you don't see the full selection below, click here (PDF) or click here (Google Docs) to read it—free!